Cozy house, renovated with great taste. The exposed stone exteriors preserve its authentic appearance and the interior, by its layout, decoration and choice of materials, offers a great comfort of life. It is around its landscaped garden, with an outdoor lounge, barbecue and swimming pool, very sunny that articulates daily life. find the 3 rooms of which a parental suite. Thanks to its location and its climate, the village of Sournia offers a high quality of life in all seasons with the conveniences and activities on site: grocery / bakery, pharmacy, restaurant, bar, post office / tourist office, petrol station, equestrian farm . As you first approach the small, but active, village of Sournia from Perpignan, you will be struck by the magnificent mountain views. Mount Canigou, the sacred peak of the Catalans, is often snow capped until June and dominates the landscape of the area. If you are lucky enough to come in spring, the peach and cherry blossom in the foothills, frame this famous landmark beautifully. 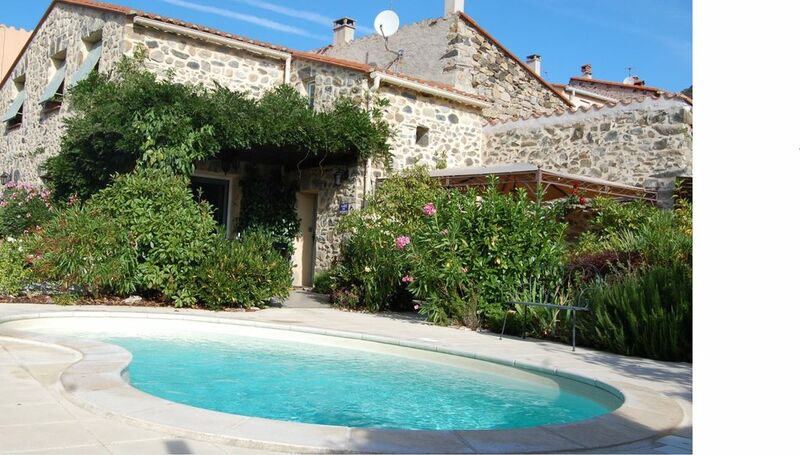 Surrounded by ravishing landscapes, from wide beaches at the coast to the incredible backdrop of the mountains, with stunning rock formations nearby and vineyards and fruit orchards in the valley, "Maison Arthe" offers you a wealth of places to explore. Bedlinnen, towels and pooltowels to rent at 15 € pp per week. Private and secured parking space for one car. Second, private parkingspace for a second car in front of the portal. This is a lovely little house tucked away up a mountain in a very quiet, pretty little village. The local auberge does very good food at a good price & the staff are lovely. The village has one shop run by a lovely lady where you can buy a fair selection of fayre. The pool at the house is small and you don't actually get pool towels, but have to use the 2 towels you can rent for extra, along with the bedding. There is a washing machine & dryer so you can wash these as often as you want. No iron/ironing board were to be found, but we managed without. The kitchen is very well equipped with lots of crockery & pans. That said we mostly ate out at lunchtime either in the auberge opposite, or a local village & had bread/ham/cheese/fruit etc in the evening. Herve next door is lovely & a great source of information. The best road down/up the mountain is the one to Ille sur Tet (619). The others are single track & can be a bit hair raising! Takes about 20 - 25 minutes to get down the mountain onto a major road. Carcassone is about 2 hours. Villefrance de Conflent is better & not as far. Great little get away. Very quiet location. We thoroughly enjoyed our stay in House Arthe. A charming house and lovely garden. We found the house mostly well equipped, the pool area and covered lounge area was very relaxing and thoughtfully laid out. Sournia village is a great example of a fast disappearing traditional French village, very friendly and one of our highlights was watching France win the World Cup in the very hospitable local bar. The owners have been very helpful and always available. A beautiful area and our stay wasn't long enough! Nous avons passé un agréable séjour dans cette maison, située dans un petit village sympathique et une belle région. Joliment décorée avec des pièces confortables et bien équipée. Seul bémol: nous sommes en litige avec les propriétaires qui nous ont retenus 100€ sur notre caution pour la détérioration de 2 bains de soleil dont nous ne sommes pas responsable. comme personne n'est là pour vous accueillir à votre arrivée, exigez un état des lieux ou faites le vous même avec photo à l'appui. Nous espérons que les propriétaires finiront par être convaincus de notre bonne foi. Maison très agréable, rénovée avec beaucoup de gout, et bien équipée. Propriétaires très gentils et réactifs pour les petits ennuis techniques.